Drama. Mr. Cramer, and many, many, other investment professionals think that there should be – must be – some relationship between a company’s earnings in the current quarter or year, and forecasts of the same, for better or worse, and the company’s stock price (The Street, May 22, 2013, Cramer: They Were Wrong About Whole Foods). And they are dismayed and surprised when that isn’t true – that it doesn’t work out, doesn’t make sense – and they end up looking for some kind of strangeness in the market that might make it true if things were “correct” (please see our earlier Post, The New Wave Markets, May 2013). 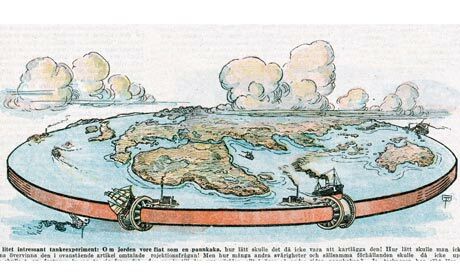 Gentlemen, that has never been true, but, we must admit, it might defy common sense in the same way that the flat earth beguiled the pre-Columbians. But “earnings” are not cash flow nor debt nor debt service, and there are no “holes” in the stock price that need to be “filled” in order to “round things out” and avoid “gaps”, we guess (ibid, The Street). 4. The Risk Price (SF) does work. The Risk Price (SF), of course, is our best estimate of the “price of risk” which is determined by the demonstrated “societal standards of risk aversion and bargaining practice” (please see the references below) and it’s disconcerting that investment professionals don’t share the same sense of things that, on balance, implement stock prices, and that they are, therefore, cast in a logical space that is more familiar to religious professionals. We, on the other hand, need to take defensive actions to protect ourselves against unexpected or difficult to rationalize leaps of faith, because a lot of buying and selling of stocks, for whatever reason, can certainly affect the ambient stock prices for reasons that we can’t explain. 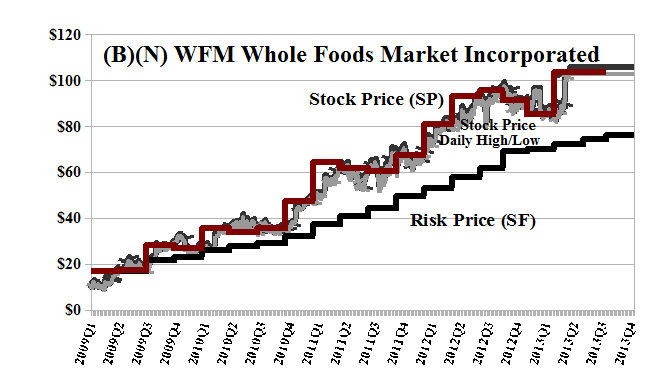 Whole Foods has been in the Perpetual Bond™ since $20 more than three years ago and is still in the Perpetual Bond™ now at $100 because, and only because, and for no other reason, than that the ambient stock prices as summarized by the Red Line Stock Price (SP) appears to be above the Black Line Risk Price (SF). Please see Exhibit 1 below. But, to stay there and not be sold out by a stop/loss or call against our long position, we have to exercise some vigilance. The indicated downside in the stock price due to the demonstrated volatility of the stock price is as much as minus ($7.50) per quarter, and we should not be surprised at any stock price between the current $100 and $93 or $108. The current dividend yield of $0.20 per share per quarter is miniscule at 0.75% for a payout of $150 million per year to the shareholders on gross revenues of $12 billion and an operating profit of $4 billion and operating income (after selling, general and admin expenses) of $1 billion, which is not bad for a grocery store. We can stay in the store, so to speak, by buying the July put at $100 for $2.25 per share today, and partially offsetting the cost of that by selling or shorting the July call at $110 for $1.20 (or $105 for $2.80, and make a profit on the collar, but it seems a bit narrow), so that for a cost of holding the stock at $100 and the collar at $1.05 ($2.25 less $1.20), we’re good to go between $100 and $110 for the several months; we hope, but if not, we might need to roll the collar up and forward on this “high maintenance” stock. But, we certainly know why we’re doing it. Whole Foods Market Incorporated owns and operates the chain of natural and organic foods supermarkets. Its products include seafood, grocery, meat and poultry, bakery, prepared foods and catering, specialty, coffee and tea and educational products. From the Company: Whole Foods Market Incorporated owns and operates a chain of natural and organic foods supermarkets. The company offers produce, grocery, meat and poultry, seafood, bakery, prepared foods and catering, coffee and tea, nutritional supplements, and vitamins. The company also provides specialty products, such as beer, wine, and cheese; body care products; educational products, such as books; floral items; and pet and household products. As of May 7, 2013, it operated 349 stores in the United States, Canada, and the United Kingdom. The company was founded in 1978 and is headquartered in Austin, Texas.